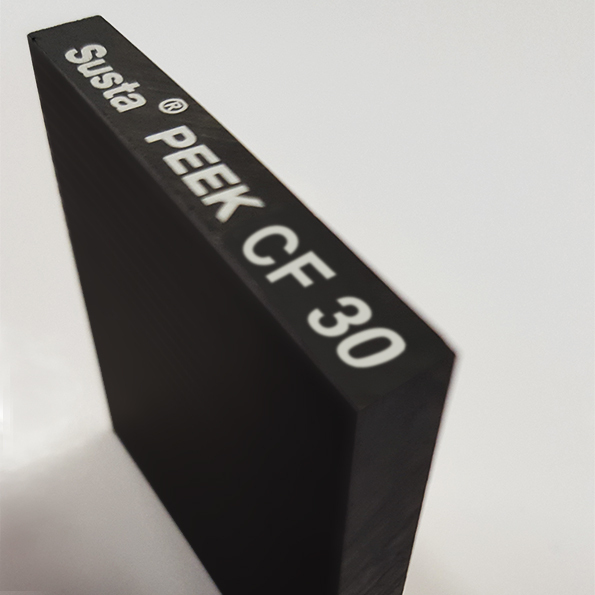 SustaPEEK CF30 is a 30% carbon fibre reinforced grade that combines even higher stiffness, mechanical strength and creep resistance than SustaPEEK GF30 with an optimum wear resistance. The SustaPEEK family of materials is based on polyetheretherketone resin. This semi-crystalline advanced material exhibits a unique combination of high mechanical properties, temperature resistance and excellent chemical resistance making it the most popular advanced plastics material. This 30% carbon fibre reinforced grade combines even higher stiffness, mechanical strength and creep resistance than SustaPEEK GF30 with an optimum wear resistance. Moreover, the carbon fibres provide 3.5 times higher thermal conductivity than virgin PEEK, dissipating heat from the bearing surface faster. Indent only. MOQ may apply.